Cheryl, my friend and business partner, and I have such fun with our Bed and Breakfast, Journey's Inn. It's been bliss getting it fixed up and making our guests feel welcome. We love providing opportunities for our guests to experience magic. Our tagline is "Escape the Ordinary." We believe that a "steady diet of ordinary" dulls the senses and takes you further away from possibilities God has placed in front of us. Anyway.... we have three turtles in the pond at Journey's Inn. 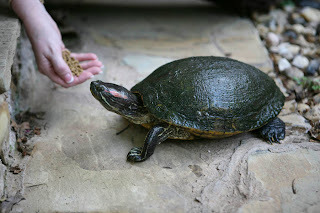 I love hand feeding our turtles Yurtle, Jimmy Chitwood and Juno (when she makes an appearance - she's shy). Someone suggested that we should let our guests be a part of the turtle feedings. I thought that might have some fun merit. Well, I bought some wooden skewers at the store that could be used in feeding the turtles. All you would do is put a grape or another piece of fruit on the end of the skewer and the over zealous turtle wouldn't accidentally get your finger. Vann now teasingly refers to the skewers as turtle sticks. Our guests last night, Cindi and David, came out to see the turtles being fed. We enjoyed a good conversation. But, Vann continues to relentlessly tease me about the turtle feedings. He joked that we should put in a kiosk where our guests can purchase their "very own" turtle sticks for a quarter each. Then he suggested our guests can have their very own souvenir of an autographed turtle stick. Eeba Geeba. Trying to run a business here, Bucko! So, to avoid being teased further :), I'm just going to let our guests know they can feed the turtles if they wish and I'll provide them with the "turtle sticks." Guess they won't get to see Jimmy Chitwood do his cute little turtle dance or Yurtle almost climb up in my lap. Oh well. Tee hee! I think "turtle sticks" are a fine idea, and a vast improvement over much of what I've seen or heard occurs at SeaWorld during the feeding of their various whales and dolphins. I'd suggest you consider tossing the "turtle stick" into the appreciative crowd at the conclusion of each feeding. xoxo... you are the best!! Your joy is contagious. Sometime I need to come over and have some moments of peaceful rest and relaxation, all the while enjoying feeding those turtles from a new set of turtle sticks! I am voting for "Yertle" as the friendliest turtle ever! !